Apple trees are a great addition to any landscape, and if healthy, will provide an abundance of fresh fruit. However, from time to time, apple tree problems do occur and require attention in order to keep trees as healthy as possible. Don’t let your tree trick you. Even if it appears to be vibrant, you may occasionally wind up with an apple tree without fruit. 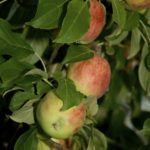 Apple tree fruiting issues can be disconcerting to the home gardener, so learning how to get fruit on apple trees is helpful. It goes without saying that most apple tree fruiting problems can be avoided by growing healthy trees. Obviously, a healthy apple tree will produce more fruit than a sick tree. Providing optimal conditions for your tree and sticking to a regular maintenance schedule will help your tree produce the most fruit possible. Address all insect or disease problems promptly, as fruit size and crop yield is dramatically influenced by both insect and disease damage. 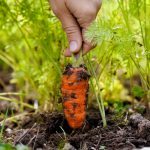 If you are unsure of how to diagnose or treat insect or disease issues, contact your local Cooperative Extension Department for assistance. An apple tree without fruit can happen for a number of reasons. Learning more about these apple tree problems can help if your apple tree does not bear fruit. If your apple tree is healthy but does not set fruit, it could be due to climate issues. Fruit trees require a period of cold weather to end dormancy and encourage spring budding. If the winter is mild, growth will be slow and the blooming period extended. This makes the tree susceptible to frost damage, which influences fruit production. In order for fruit to be produced, most trees must be pollinated. 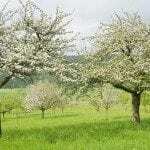 Cold weather and a reduction in pollinating insects can cause trees to blossom but bear no fruit. 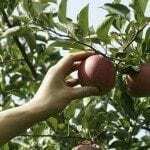 For best results with apple trees, plant two different varieties close together for cross pollination. Some fruit trees, including apple, may bear very heavily one year and only minimally the next. 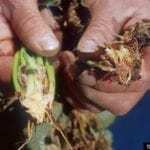 This condition is known as biennial bearing and is thought to be due to the influence that a very heavy crop has on crop production the following year. An apple tree without fruit may not be getting enough sun or water. Poor fruit production can also be caused by over fertilizing. Provide a 2 to 3-inch layer of mulch around the tree, but not touching the trunk, for protection and moisture retention. Read more articles about Apples.